What are Dilaudid and Oxycodone? Dilaudid and Oxycodone are both the group of potent opioids. They are prescription medication given to patients to relieve mild to severe pain. 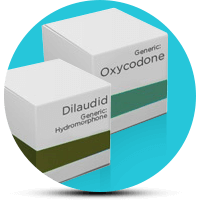 Dilaudid is the generic variant of hydromorphone hydrochloride. Also, the two most popular brand names for Oxycodone are OxyContin and Percocet. Oxycodone was first introduced in the U.S. in 1939. However, it was not until 1996 that it gained mainstream popularity in the world of medicine. This was after Purdue Pharma started to manufacture it as OxyContin. On the other hand, Hydromorphone was first synthesized in 1924. And they introduced it to the public in 1926 under the brand name Dilaudid. What are the similarities and differences between Dilaudid and Oxycodone? Both of these two opioid substances share certain similarities. For example, both Dilaudid and Oxycodone are available in tablet and liquid forms. They also have extended-release forms, and roughly share the same therapeutic actions and side effects. One of the main differences between these two drugs is that Dilaudid is more potent than Oxycodone. Dilaudid is often prescribed as a pain reliever to people who suffer from agonizing pain, like cancer. In addition, they also give it to patients who cannot get enough relief from milder painkillers such as Tylenol or Codeine. It is also a common prescription drug for pain triggered by surgery or broken bones. In any case, Hydromorphone hydrochloride is a better alternative to get immediate effects and administer a scheduled dosing. On the other hand, Dilaudid addiction signs develop faster and is relatively hard to treat. What are Dilaudid and Oxycodone side effects? Can Doctors prescribe Dilaudid and Oxycodone at the same time? Yes, Dilaudid and Oxycodone are two very potent, fast-acting prescription medications. However, in some cases, the doctor might see the need to prescribe both of them at the same time. Additionally, it is possible for the patient to develop tolerance to one or the other. This means he/she will need an increased dosage in order to achieve the pain-relieving effect. Even so, combining Dilaudid and Oxycodone can be very dangerous. This is why one should never try to do this on their own. What to look out for when taking Dilaudid or Oxycodone?